The Capita/UK Govt JV is having a planning session on 23rd May. This is your opportunity to suggest agenda items. Don't mess about with paragraph numbering or translating into Bulgarian. Here's what I suggested. 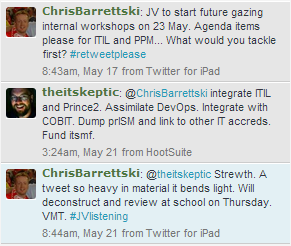 I've wondered before about did the ITIL and Prince2 teams ever cross the hallway? Did the Prince2 guys get all the good carparks? There must be some reason why they barely mention each other, but it isn't a good one. It is downright bizarre. This is my mission for this year, to promote discussion between the ITSM and DevOps camps, via the Kamu initiative. Any future version of ITIL needs to understand, support and absorb the ideas in DevOps. If the JV is really providing value, and not just soaking it up, it will lead the work to figure out how. Likewise COBIT has done all this fabulous work to structure IT management and governance in a systematic taxonomy. After-the-fact mapping papers are not enough. ITIL should leverage the IP in COBIT, not try to reinvent it (badly). COBIT is my choice of primary framework - it does it better. ITIL's strength is to provide greater depth, elaboration. 4) Dump prISM and link to other IT accreditation schemes. prISM is a silly idea, collapsing under the weight of its own pretentiousness. It is too big to be an ITSM accreditation scheme and too small to be an IT one. The CITP in the UK and the equivalent Aussie and Kiwi schemes are a model of what we need. (I'm an ITCP in New Zealand). If the Yanks don't have one, that's their problem and not ITSM's job to solve it. Sure there is a discomfort level with the JV putting money into itSMF, but that is better than them getting a free ride off itSMF's volunteers. it will be fine if it is done overtly and transparently this time. The obstacle will be itSMF's dysfunctional constitutional structure and toxic internal politics - I wouldn't put money into itSMF the way it is now. itSMF needs to get its s**t together first. The alternative would be for the JV to dump itSMF entirely as more trouble than it is worth, and align with another user community such as - say - ISACA, with far superior governance, and service to members. If ISACA had pursued its promise to reach out to a wider constituency than auditors and security wonks, it would be better placed for this. That's my five. What agenda items would you table for the JV?